Always darkest before the dawn? "Always darkest before the dawn?" With the Lyra Symposium wrapped, I've got some work to do over the next day or so to put together numerous notes, both electronic and the old-fashioned hand-written variety, and combine those with some hopefully cogent thoughts about the goings-on at the Symposium during its last half-day. In the meantime though, one "big picture" thought to share, especially after the last sessions, which included rather negative news about the inkjet market generally; reports on photo printing that forecast single digit percentages for captured photos printed, with photo specialty printers continuing a retreat into what I consider less-than-mainstream niches; and a Wall Street view that tracks a plethora of industry-wide woes from top to bottom among traditional players in the business. 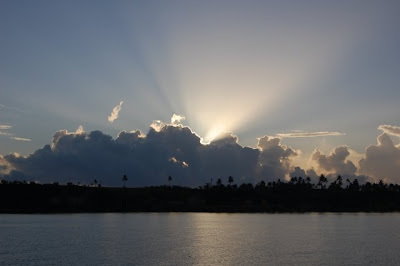 Which all, for me, evokes the old saying, "it's always darkest before the dawn". Time will tell as far as the veracity of that statement in this situation, but it offers a thread of optimism, as does the nearly universal pessimism to the contrarians among us! "Conference networking as a human biological need"
I’ll beg my readers’ pardon for postponing the blog posts covering the Lyra Symposium’s last afternoon of sessions until tomorrow (Pacific Time). My enthusiasm for networking (after all what’s a conference really for?) overtook my blogging responsibilities during the final breaks of the show, and with no connectivity in the ballroom, I ran out of time to craft and post during our final day. I am sure you will forgive me, and come back tomorrow (Thursday) for the final posts from the Symposium. As far as some "virtual networking" check out my colleague’s posts from the conference – Greg Walters at Death of the Copier, Rob Sethre (a Symposium Wall Street Panelist) at The Woodford Group blog, and Photizo Group marketing VP Matt Zimmer at Printer Industry News. 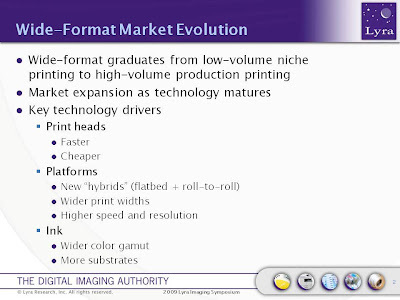 “Wednesday Morning -- Wide Format and Green"
Wednesday morning, January 28th, 2009 the 2nd and last day of the Lyra Imaging Symposium kicks off with a “wide format” segment, with industry member Rak Kumar and Lyra Analyst Rocheleau. First up with his presentation "Wide Format Trends and Opportunities" is Rak Kumar, Vice President and General Manager, Rastek. Kumar covered the history of the segment, technology trends and a “how we got here” synopsis, as well as current market opportunities and future directions. Basically it was the perfect industry pitch, in this blogger’s humble opinion. It was informative, included some excellent historical perspective and current market analysis, without overly extolling the virtues of his employer’s product and service offerings, more or less letting the company's advantages speak for themselves. An example graphic from Kumar's pitch is shown below. David Rocheleau, Vice President of the Lyra Consulting Group, followed with "The Evolution in Wide-Format Printing: A Market in Transition", and covered lots of ground. Some of his topics are presented in the slide below. Charley LeCompte, president of Lyra, followed with the kick-off "Green" portion of the Symposium, in a presentation entitled "Green Is the Theme for Imaging Vendors". With the progress made recently in wide format and its improved environmental friendliness, it was a logical transition to look into the Printer Industry's Green Initiatives and why 2008 turned out to be such a momentous year in activity and discussion. LeCompte covered, among other topics, the first true eco-products – products whose primary selling point is an environmental advantage, including the HP Designjet L65500 – and its non-solvents approach and the Epson EDC-10, an inkjet printer introduced in Europe and China, with its 8000 page ink bags – with a 50 Euro deposit, though in China not touted for environmentalism; other 2008 landmarks such as HP's closed-loop cartridge recycling (announced during last year's symposium and covered here); the aftermarket's players all trying to out-ecology each other; accelerated cartridge collection including Japan's collection boxes sponsored by six leading vendors and located across Japan in post offices; and HP’s "Eco Highlights" Product Tag, also covered in this blog. LeCompte then moderated a lively panel, featuring WooJin Kim, Charm Regent Ltd.; Brad Roderick, InkCycle; Stacey Wueste, Hewlett-Packard Company; and Tim Needham, SMART Papers. This blogger was surprised not by the many good ideas and positive proposals, but by the frequency words like "they" and "them" came up from at least one of the panelists, regarding potential regulatory action, and that same panelist's assertion that somehow the industry brought it's own problems on by initiating cartridge recycling just a few years ago. More informed industry members will know that cartridge disponsition (beginning in my memory with toner cartridges in the 1980's) has as much to do with value as waste. It's not just empty water bottles and detergent containers, but rather the salvaging of high value-added content in the ink and toner cartridges that make them desiralbe as potential refill/reman targets, in additont to the environmental logic of recycling. “Managed Print Services: A Necessity in Today’s Business Climate” Steve Reynolds of Lyra was back this afternoon for the MPS Segment, tracking the history of Managed Print Services going back to at least 2003, from Office Document Assessments through the current rush to get involved by many categories of hardware and software companies, services companies and resellers. Photizo Group’s CEO and founder, Ed Crowley, followed Reynolds with “The Real Story behind Managed Print Services”. Drawing on Photizo’s deep understanding of MPS, Crowley shared some of the the dynamics of this fast-growing segment of the Hard Copy business. A 22% CAGR for any (large) segment of the business is enough to get the attention of the industry. Following up on Reynold’s description of the building blocks of MPS, Crowley highlighted more of the nuances of the business, including the growing importance of the IT Manager as the overall MPS decision maker. Photizo’s three-stage MPS Adoption Cycle model was reviewed, which resembled the three reasons for replacing a customer’s output fleet presented earlier in the day by InfoPrint’s Paul Preo. Q: Dealerships and channel moving from product focus to service focus, what is the model? Pre-sales and post-sales, compensation, etc. A: Short version of a long answer, ideally compensation is based on account profitability. Q: How many OEM vendors are in a typical MPS engagement? A: Typically at least HP and 2-3 other brands. Never all the same, except HP is a given. Programs are out there to help. Steve Reynolds, again, doing yeoman duty as the panel chair with panelists Greg Anderson, Ricoh Americas Corporation; Roger Ellefson, Manager, Xerox Corporation ; Vince Jannelli, Sharp Imaging and Information Company of America; Gregory Ryan, Canon U.S.A., Inc. Entitled “Software for the Office”, that rather generic-sounding name means something much more specific , i.e. printer/copier and especially MFP-based solution software platforms to host specfici developments. What is the impact of the economic woes – more opportunity perhaps? Saving money via solutions for printing and copying, as with MPS, can be a winning argument when times are tight -- in Ryan’s simple but dead-on expression, “an ROI story”. Sharp’s Jannelli equates the software opportunity the buzz in the “MPS story” and the “third step” is the workflow assessment. He also equated some fot he implementation details to a home building analogy – the contractor (solutions dealer in the print/copy analogy) may care about the studs/nails/sheetrock (or Java vs Web), but the home buyer really doesn’t. Glen Hopkins, VP/GM Printing Technologies, HP. 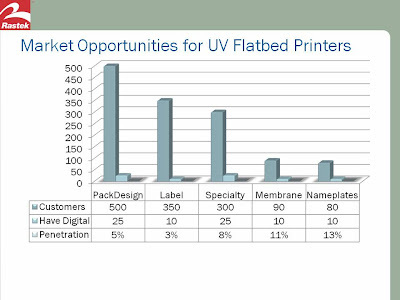 “Desktop Printing for Small and Medium Businesses – The Emerging Battlefront Between Inkjet and Laser.” Hopkins continues HP’s push for inkjet, parallel to last year’s Edgeline MFP push, but this time in the Small and Medium Business (SMB) area. (Though the effort is at least as old as two to three years with the HP OfficeJet K550.) 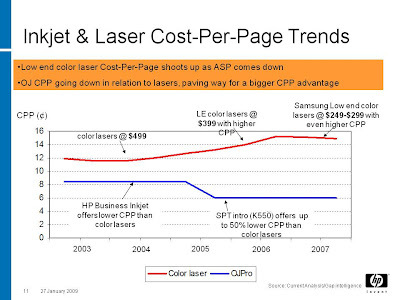 The comparisons on cost-per-page are dramatic when it comes to color – see his slide below. It’s interesting to watch HP continue this battle (the word comes up a lot) while candidly acknowledging it’s a bit of an uphill struggle with communications challenges, and perceptions about factors like print quality and water fastness being what they are. We’ll know the gloves have really come off when HP LaserJets (as opposed to Konica Minolta and Samsung printers, in this example) start showing up in their comparisons! The Toner Cartridge Lifecycle Evolves, Cortney Kasuba, Industry Analyst, Laser Consumables for Lyra Research. In a review of forecasts and other market trends in the laser toner cartridge business, the most interesting point I found was that “environmental concern is the Number One driver for returning empties” though Kasuba reports that 26% of all cartridges still go straight to the landfill. Steve Reynolds, Senior Analyst, for Lyra Research, did his traditional succinct but complete overview of this segment of the business, this year entitled “Developments and Strategies for Office MFPs”. 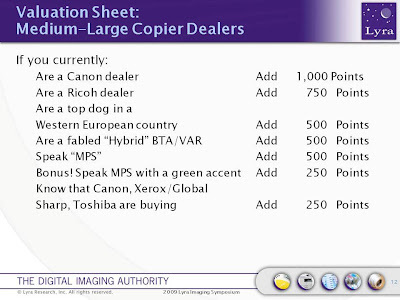 One of his slides, of the semi-facetious but on-the-mark category, was his “Valuation Sheet” for medium- to large-sized copier dealers, in light of the distribution “shortage” caused by Ricoh’s acquisition of IKON in 2008 (yes, this topic comes up a lot). See Graphic. Another point raised by Reynolds was the “color reluctance” holding back color page growth, partly at least economy- (and cost-) related. Paul Preo, newly-named VP, Workgroup and Industrial Printing at InfoPrint had a very comprehensive and interesting review of the Enterprise Printing environment, including popular Symposium topics such as the linkage between print management and “green” initiatives as well as A4 encroachment on A3 placements. He, like Reynolds, links slower color adoption (at least that the industry would like) to economic problems, but also sees some printing coming in-house and away from out-sourced printing, albeit in lower overall volumes. Preo recommends learning more at infoprint.com. Printer Industry and Channel Players. Moderator: Ann Priede, Lyra Research. Panelists: Mike Dane, IKON Office Solutions, Inc.; Greg Lamb, Global Imaging Inc.; Kevin Prewett, Ingram Micro. Acquisitions having an impact? IM no, IKON yes (! ), challenge is migrating from heavily Canon to all Ricoh. The wide format industry is newer (13-14 years old) so not as much talk of consolidation. IKON was the last national distributor out there, but it’s not over – next logical thing? Perhaps a Manufacturer consolidation? Some foresee one printer vendor buying another, or someone from outside the space coming in? In wide format space, EFI has made 13 acquisitions; they will continue to be active. Trends in leasing? Credit got tight, noticeably when GE Capital exited the market. Manufacturers are working to improve capital availability. Among some others in the wide-ranging potpourri of topics for the panel included channel conflict, the Circuit City bankruptcy, and Samsung’s impending major thrust into the business. The honor of being the "official" live blogger for Lyra's annual Imaging Symposium can't be overstated, but there are a few obstacles to success. Without a live WiFi signal in the conference room, I'm sure I pay better attention to the speakers, but blog updates (and maybe even more importantly, fixes to those pesky typos only noticed after the first "publish" command) are not as frequent as I'd like. Alternatives? Just make the best of it. The walks back and forth to the room and online access during breaks are certainly good exercise -- though they cut down on the networking time. And as much as I like the iPhone, its Safari browser and Edge network are, I must admit, totally inadequate for blog post creation and editing! Following Frank Stefansson's opening welcome, Keynote #1 was a strong effort, by Senior VP Corporate Communications, Product/Solutions and Channel Marketing, Ron Potesky. His theme? Change can be good (renamed from “change is good”). And a great point -- just what does a guy from Ricoh know about change? Plenty! Potesky’s outlined a brief history of Ricoh’s activities including acquisitions of Savin, Gestetner, Lanier, Hitachi, IBM (Infoprint, actually currently still a Joint Venture but leading to a full-fledged acquistion), and ending (for now?) with IKON in 2008. He likened the IKON acquisition to Xerox’s 2007 acquisition of Global Imaging, a large non-prorietary base of customers. One Conclusion: Supply outweighing demand, significant consolidation. A question though -- are we in the industry DRIVING OUR OWN DEMISE? We're offering to solve many customer problems, like lower Total Cost of Ownership (TCO), a focus on the environment, printing less, controlling color, all with the underlying theme of "Spend your money with us, not them…"
And unlike the later presentations, there was time for a couple of questions. Q – A3 and A4, does Ricoh see A4 MFPs taking away A3 placements? A – Absolutely! Esp in mid- and low-end markets (sements I and ii especially). Will continue, but service model for A3 is still a good economic model, with individual parts replacements. With ink technology improved to mean less “throw away” that could change. Ann Priede, VP of Publications, and Charley LeCompte, president and founder of Lyra, publisher of The Hard Copy Observer and The Hard Copy Supplies Journal, then presented the first of two “Making the Grades” – Marketing and financials – based on the printer/copier portions of the business, with today's (Tuesday) based on the copier side of things. Priede offered developments and grades in sales and marketing, products, and technology, and LeCompte countered with financial metrics and grades based on revenue growth and operating profit. Companies covered included Canon, Konica Minolta, Kyocera, Ricoh, Océ, Sharp, Toshiba, and Xerox. A relatively short presentation, it was packed with data and very interesting grading outcomes! Tomorrow's promises to be interesting when the eight top printer vendors are examined. Look ma – No slides! The first presentation to go without the usual visual aids, but a carefully prepared pitch nonetheless. Appelo pointed to the historical customer focus among the founding leadership of industry stalwarts Ricoh and HP, along with Xerox. Ownership of document output is typically spread across the organization – Xerox has an assessment that helps customers design a more efficient and less wasteful copying and printing, based on customer needs. Bottom line -- adapt to the customer! 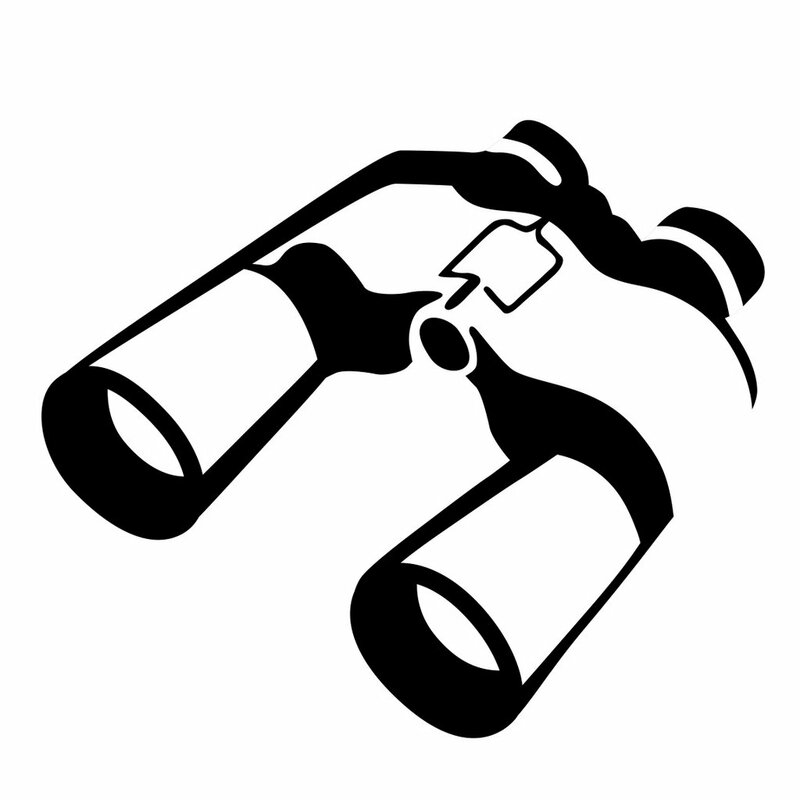 Trends include single function to multi-function machines, a “window to the world”. Another example is EIP, Xerox’s open platform for development, which makes it easy for partners to develop tailored solutions for Xerox machines. Lean Six Sigma is the tool Appelo credits for helping transform Xerox. more environmentally sensitive paper. With usage of seven hundred pounds of paper a year, per person, worldwide, and growing at least in some geographies, the making and usage of paper is an opportunity. Xerox developing a “digital paper” that would be more environmentally friendly, by using mechnanical rather than chemical means, using more of the tree and less water in the process. Partnerships were a recurring theme in the speeceh. Outsourcing of cartridge manufacturing of cartridges to Flextronics, evolving from a simple outsourcing deal to a deep partnership today. The company’s work with UPS and creative applications was mentioned, and also their partnership in document management with IBM was touted. Sourcing around the globe is key – keeping things the same is not an option. Lyra Symposium 2009 -- Ready to go! Or more accurately, let the games (yesterday's tennis and golf) end (yes, we can still have a LITTLE fun), and on with the show! My Observations column, now into its fifth calendar year in The Hard Copy Observer, tends to carry themes bifurcated between two poles: the nostalgia of “how things used to be” and the prescient of “here is how things are heading and will be in the future.” In what I consider a really successful column, a given topic can generate some thoughts apropos to both camps, and I believe this month’s subject at least approaches that. The conversion of PC Magazine as a leading print (and printer) publication in our industry, from traditional hard copy to an online and print-it-yourself-if-you’d-like publication, is that topic. The online transition provides the fodder for looking ahead, and the subject of PC Magazine in general evokes past memories of how things in the pri nter industry were formerly done. In November of 2008, the news came that the venerable publication was undergoing this radical change, and I blogged about it under the heading “PC Magazine’s all-online move.” Now that the final hard copy edition (January 2009) has appeared in my mailbox, and the insert that came packaged with the magazine, “After the January 2009 issue, PC Magazine will discontinue its print edition”, has forced me to face the finality of the decision (see image below), it seems a poignant time to look back and look forward. At the time I wrote my blog post, I realized that what had been a mainstay traditional magazine serving a key role in the personal computer industry at large was transforming to an all-online publication. Moreover, while we had been predicting the transition from the “print and distribute” to “distribute and print” model for mainstream newspapers, books, and catalogs for the past 15 years, this switch was now happening to one of our own. 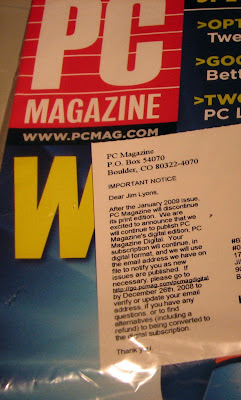 On the nostalgic side, here’s what I wrote in my blog in November about the demise of the hard copy PC Magazine: “As a printer industry veteran, the Fall of the year brings to mind the now long-ago excitement that we in the biz felt when the PC Magazine annual Printer Issue hit our mailboxes. Which companies, and models, would warrant top-ranking ‘Editors’ Choice’ awards? And what printer would grace the cover of the issue? “The annual edition set the standard for who was on top, and who was gaining, or falling. The magazine was written for technology and printer buyers, especially elite early adopters, but industry insiders gave great attention to its advice. In-the-know marketing and R&D types were recognized by their collections of back issues and cubicle clippings from PC Mag’s printer edition. And now of course, it can be found online, to be printed as you choose to! In reflecting back on my own words from two months back, I’m not nearly as emotional about “the good old days” as I was then, or at least that’s how it seems as I juggle trade show (CES) and industry conference (Lyra Symposium and Demo) travel schedules. I am also excited about numerous new industry developments, and I have done a little more thinking, realizing how the “democratization” of information, via the Web mostly, and the speed of the industry are more suited to a continual, year-round schedule of product launches and dissemination of information from a huge variety of sources. Through much of the 1980s and 1990s, the well-informed printer marketing manager could be identified by the collection of PC Magazine printer editions in his/her cubicle. Just a quick note, with a week to go, that I'll once again be "live blogging" the Lyra Research Imaging Symposium. I've blogged from the Symposium, and other Lyra events, a number of times recently, and always enjoy the challenge. Check back next week for the latest and greatest on the blog, and better yet, hope to see you at the Symposium! You can still register here. Earlier this week, The New York Times had a piece by Farhad Manjoo in their Personal Tech section "Boss, I Need a Bigger Screen. For Work Efficiency, of Course." Christopher Null, of the Working Guy Blog at Yahoo!, picks up the story with his post "Two monitors = 44 percent increase in productivity", which is how it came to my attention. His post made it to one of those "top eight" headlines on Yahoo! 's main page -- those top eight headlines that I scan regularly, figuring I won't miss something REALLY important as long as I follow that ritual multiple times each day. While the gist of both pieces is that worker productivity goes up with multiple monitors (seems like a no-brainer but important to document, nonetheless), another side to the story is that printing, for "scratch sheets" and the like, goes down. This has been my experience, at least, as I briefly documented in my comment to the blog post. It's a [sic] increasingly well-known observation among dual-monitor users that printing decreases too. I know in my own experience, when preparing articles and reports, the need to print out intermediate drafts and research notes has gone down dramatically. Does anyone else experience this? It will be interesting to see, at this blog or at Yahoo! 's, if other readers concur or disagree. BTW that's my first "[sic]" on myself, that I can remember anyway! As always, it's interesting to read the clippings following the close of the Consumer Electronics Show, in this case the 2009 edition, and as usual searching for mentions of printing and imaging products. My favorite so far is CNN's "New year, new toys: eight highlights from CES", where Brandon Griggs gives two of his eight spots to imaging products covered here previously. Polaroid's Instant Digital Camera, featuring an integrated ZINK printer, gets one of the eight top spots, and the Livescribe Pulse Smart Pen (see "A Demo 2008 Desert Delight") grabs another. With coverage like this, I'd classify the 2009 show as a great CES for printing and imaging! Samsung high-end MFP design -- look to the kitchen? Business Week's Cliff Edwards has a piece on printers, Samsung specifically, "Samsung: Rethinking the Printer Business", that highlights the company's emphasis on industrial design and its belief that it can be a potential competitive advantage in the printer business. We've become accustomed to seeing the Samsung ML-1630 monochrome laser printer (pictured below-left), and then the follow-up SCX-4500 all-in-one (featured by Business Week), and hearing about these products' "piano-like" sleekness and good looks, but what about applying these same design ideas to higher- end departmental-scale printers and copiers? The article quotes Samsung Electronics digital media group's president, J.W. Park, as pressing for the moving up of the design emphasis all the way to "giant office printers". Business Week then quotes market leader HP's (NYSE HPQ) laser printer business leader, David Murphy, in a somewhat disparaging remark that includes the phrase "form follows function". While office-based buyers may or may not be as subject to style as the consumer, viewers of the advertising-industry-oriented series Mad Men, set in the early '60's, can appreciate the evolution in form as well as function that's taken place with office copiers in the intervening decades. But back to Samsung, and a glimpse into what they might do with larger office machines in the future. 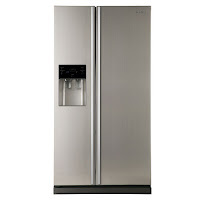 In a closer match of product size if not target market, Samsung kitchen appliances are known for stylish design as a trademark of their brand and some would say competitive advantage (for an example, see "NEWS: Samsung Combines Performance and Style With Its New Kitchen Solutions"). After nearly a full day at CES, various printer efforts caught my attention. ZINK, after announcing a partnership with Lite-On to work on printing photo frames, and continuing their Polaroid agreement with an official announcement of a second product, a digital camera with built-in printer. Also, today the printer announcement at least some in the industry were waiting for was came today (Friday), with the Dell (NASDAQ DELL) Wasabi photo printer, originally reported by Engadget in September. See "Dell (finally) confirms its portable Wasabi Zink printer". HP (NYSE HPQ) is showing their iPhone photo printing app at both their booth and in a special "phone booth" exhibit in the Central Hall foyer. After having bad luck getting my iPhone to print after downloading it before Christmas (see "iPhone Printing Boom! "), this time I had good luck and a pleasurable experience printing to an HP WiFi-enable inkjet all-in-one. Samsung devoted a small corner of their massive booth to a few laser printers and MFPs, featuring a "run-off" between one of their laser machines and a disguised "famous maker" inkjet. In addition to a speed test, they also had an toner/ink permanence test with a continual water drip on comparable print samples. Canon and HP had their printer line-ups on display, though these were overshadowed by more typical "consumer electronics" offerings, befitting the Consumer Electronics Show. Mid-afternoon Vegas time on the first day of CES 2009, and the Google News index is up to 543 hits on "CES Printer" with page-one names that are very familiar to readers of this blog, including Polaroid, ZINK, and Memjet. Notable news comes from the new-to-me site printercomparison.com, with "CES 2009: Memjet introduces new printhead" and the AP round-up piece "Even in recession, CES to have stuff worth seeing" where Memjet is referenced among the dozen or so show highlights. The former piece refers to Memjet's parent as "Silverback" rather than the correct Silverbrook Research. A simple typo, or a bit freudian? I will be visiting and blogging from those companies' exhibits, as well as others, tomorrow, Friday January 9th, so stay tuned! I apologize for being a blogger blogging about blogging, but every once in awhile I need to be indulged! Second, the first full week of January means CES, the Consumer Electronics Show in Las Vegas, and I will be making my semi-regular journey there later this week. Tying it back to resolutions, I'm resolving to do more with Twitter in 2009, so I will be "tweeting" from the show, if you'd like to follow me.